The Put-in-Bay Gas Station is the only place on the island to fuel up vehicles. Here, guests can stock up on beer and snacks. Also, they feature daily breakfast and lunch specials at the Pit Stop. The Pit Stop is the hot food component of the gas station. Locating the Put-in-Bay Gas Station is easy. The location is on Langram Road, just down the street from the Miller Ferry Lime Kiln Dock. The United States Post Office of Put-in-Bay and Island Hardware are next door. Also, just look for the green dinosaur on the facade of the structure. 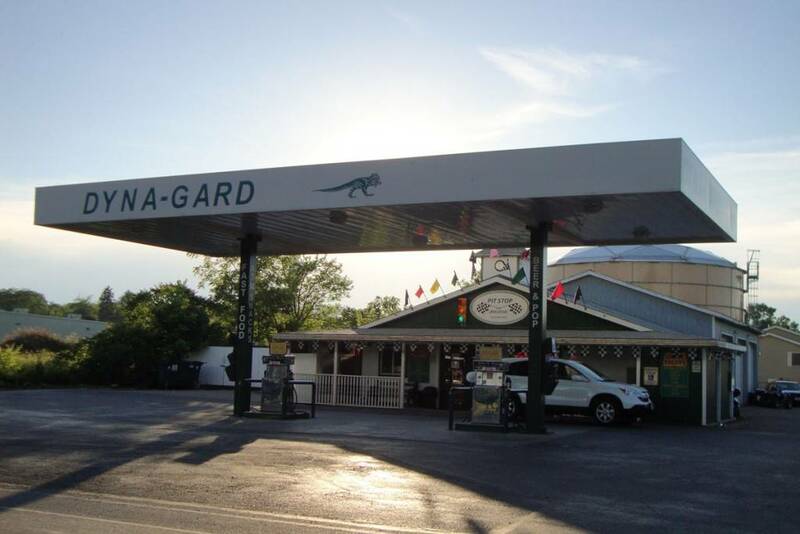 The gas station is also known as Dynagard, evidenced by the prehistoric logo. Inside, guests can choose from a wide selection of snacks and drinks. Cold beer, soda, juices, milk and more make up the drink selections. Additionally, fresh coffee is made daily. There are many different creamers available to customize your cup of coffee. Snack options include chips, beef sticks, candy bars and pastries. Beyond the standard gas station choices, they also have great hot food options. The Pit Stop food station boasts fresh soups and entree options daily. This is one of the fastest and most economical lunches on Put-in-Bay. Also, there are hearty breakfast sandwiches, scrambled eggs and bacon to start the day right. No matter the time of day, the Put-in-Bay Gas Station and the Pit Stop have you covered. So, during a trip to Put-in-Bay, stop on by to fuel up. Fuel up vehicles, boats, all terrain vehicles and more. Then, fill up on the vast assortment of snacks and meals. Odds are you will leave with both of your tanks filled! Don’t run on fumes, stop in today and get your fill at Dynagard. You’ll be glad you did!